Today, we’d like to talk about digital comics. Specifically, how you can bring your comics onto your marketplace of choice, where you need to sign up, and other tips and lessons we’ve learned along the way in formatting and preparing your files. Now, we will be the first to admit that this process can be time-consuming, laborious and really, really confusing. When releasing Torchbearer to the different marketplaces, we’ve found ourselves screaming at our computers once or twice out of sheer frustration. But, once you understand how each store works, it’s simple to reproduce and would highly recommend you go along the DIY route. You have your individual comic book pages digitized and ready for publication. You know how to create PDF files. You can use Adobe Acrobat Pro or some other kind of software, but this skill is important. Without it, you won’t be able to submit to most of our marketplaces without the ability to generate a PDF. You have a computer, or access to one for, like, an hour or more. We use Mac’s here at Odd Truth, and will gear some of our steps towards Mac OSX, but we’ll do our best to provide Windows alternatives when possible. The first thing you need to do is sign up for a Comixology Submit account at this link. Once you fill out your account information and all the other things they ask you, you need to submit a 600×600 px image representing your comic book series (or single-issue). This is what people will first see when looking up your content, so it’s best to make it very appealing. You’ll also submit a cover for the issue, and finally a PDF of your issue. Once that’s done, sit back and relax: you’re done. Comixology will convert the PDF into their respective format and they’ll control when it’s released. Unfortunately, if you don’t have a Mac, you’re pretty much screwed. There are some programs that Apple requires you to use to upload your comic book through the iBookstore that (*surprise*) only run on OSX. In any case, to get started you need an iTunes Connect account, which you can sign up for here. Once completed, you’ll need to either create a book as an ePub file or using iBooks Author. I use iBooks Author for the time being, and once I tamed it with the help of Apple engineers at WWDC, it works pretty well. First things first, you MIGHT need to reduce the size of your files if they are large. We know we had to for ours. Now, downscaling each file individually is no fun. Luckily, at this stage you’re on a Mac, so you can take advantage of Automator to do all of this work for you. Since I couldn’t find a way to export the script itself, I’ll attach an image of the Folder Action we used to convert Torchbearer #3. 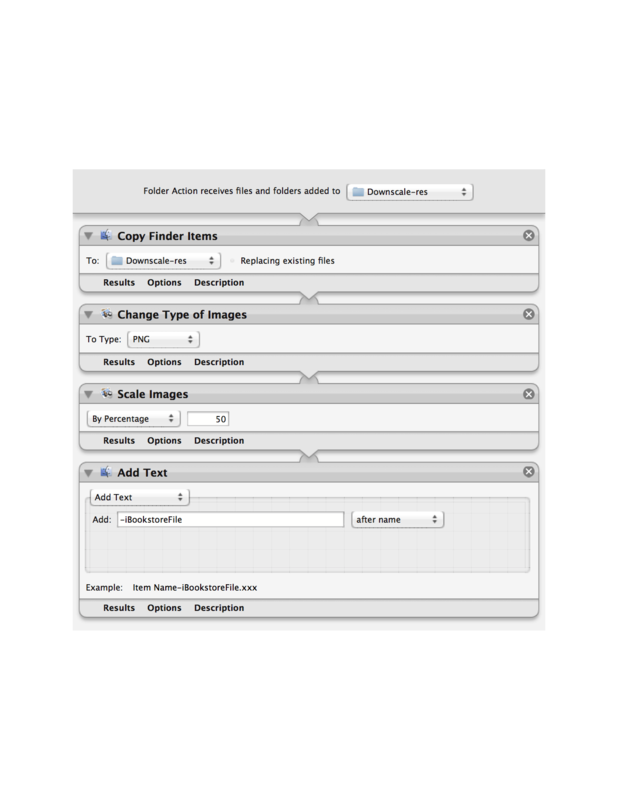 If you’re unfamiliar with Automator, we recommend you go over this great tutorial. Now that your files are ready, time to upload them to iBooks Author. I found this step to be quite difficult, as iBooks Author was not really designed for books that only use pictures. At WWDC, I got some help from the engineers who built iBooks Author and, thanks to their help, we made a template for comic books that I was happy enough with, which you can download here. With the template, you can just create more pages using the model we’ve provided. Once you make your book, you’ll export it as a “Standard book for iBooks”. You should also edit your comic book down to the few pages you want to show as samples. Then, export these pages are “Sample book for iBookstore”. From here, you’ll need to log in to your iTunes Producer account , download iTunes Producer or iTunes Producer for Books (whichever of the two), fill out the information they ask for and submit! Usually, it takes 24-48 hours to see your book published. First, you need an Amazon KDP (Kindle Direct Publishing) account. Once your account is active, Amazon made our job somewhat easier by releasing Kindle Comic Creator. This piece of software allows you to drag and drop your images and create a comic book for the Kindle Store. BUT, there’s a catch. Due to the price royalty structure Amazon uses, it becomes EXTREMELY IMPORTANT for your comic book to be as small in file size as possible. If you want to sell your comic book at 1.99 (or less), you MUST have a file size less than 10 MB. No exceptions (and a lesson we learned the hard way going back and forth with the Amazon Customer Service reps (which are great, by the way)). Once you “Build and Preview” your comic book, log in to your KDP account and “Add a new book”. FYI, the book you’ll look for when asked to upload it will have the .mobi file extension. It will be in the folder that Kindle Comic Creator makes for your comic. Once submitted, it’s 24-48 hours and then you’re done! First, you need a Nook Press account. After registering, you need to have your comic book in either a .DOC file, .ePub file or an HTML file. If you have Adobe Acrobat Pro, you can convert your PDF into an HTML file or a .Doc file. Be warned, this process can screw up some of your images . It’s best to open them up after converting them and inspect them, replacing the damaged images (if any). Once you have your desired file, sign in, upload, fill out the information they ask for and voila! Both of these services are really straightforward. You can sign up to DriveThruComics here and for Graphicly here. Both require PDFs, so you can use the same one you submitted to Comixology. DriveThruComics was a little tricky finding out how to upload my file, so we’ve made it more accessible through here. Once you start the process with either of these two sites, it’s a simple matter of following their instructions. After which, it takes at most 48 hours to publish your comic book in either marketplace. That’s it! You are now armed with the knowledge necessary to publish in most online comic book marketplaces. Go forth and publish amazing stuff!